Some reviewers comment this book has a great sense of place - and that is perhaps because it is set in real places! Most of the action takes place in or around Christchurch, in Dorset, a lovely little market town near where I live. The book also mentions Highcliffe, Bournemouth, Swanage and Southampton, which are nearby towns. Jen lives in Christchurch, which is why much of the action centres there. But Solent House and Gardens is a purely fictitious setting which I transplanted on the location currently occupied by the Highcliffe Castle grounds. Highcliffe Castle (park at Highcliffe Castle car park - BH23 4LD). This is the location for my fictional Solent House and Gardens. But it is NOT the setting. (In other words, fictional Solent House and Gardens occupy this space, but are not at all like the reality - except for the sea view.) You can get a snack meal or coffee there. This is not a long walk in terms of distance, but how long it takes in time is all down to what interests you - and your pace! Allow half-a-day to meander and snack, or much less if you are a racer! There are many places for a picnic near the car park, including the delightful little gardens to the left as you exit through the archway, or in the Christchurch Harbour area, to the right. 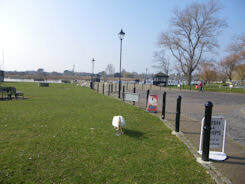 As you enter the harbour square, to the right, the Old Mill Tea Rooms offer a rest after your travels getting there (dog-friendly). Nearby, just up the road, there is another more up-market - and time-consuming - alternative on the left: The Upper Deck (dog-friendly on the outside covered veranda). Looking across the River Stour to the left from the harbour, you see the distant Hengistbury Head (setting for my novel Sandman). Turn left and walk a short distance down Wick Lane and then right into short little Silver Street. At then end turn right into Wick Lane and follow it along. On the right you will soon pass The Thomas Tripp pub - where Jen sings in the novel. (They have live bands Friday and Saturday evenings - not Thursday, as in the novel). Mid-way along the High Street, turn right into Saxon Square. There are many choices for places to eat and drink in the High Street and Saxon Square. Next, retrace your steps along High Street to the mini-roundabout and turn left into Castle Street. You soon pass the gates on the right leading through to the ruins of Christchurch Castle on its own mound of a hill. (The novel says this is part of Jen's view from her studio flat). 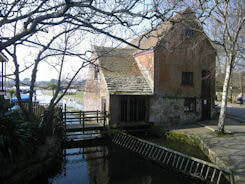 Walk further along the street until you reach the bridge crossing the River Avon, and turn right into the path between the river and the mill stream. If you're lucky, you might see the fishermen in their flat-bottomed boat near the bridge, mentioned in the novel. Next to the river and the bridge are the seats where Jen likes to sit and think. Look back at the buildings on the road, to the left of the bridge, and that is, more or less, where I imagine Jen to live (although I cannot specify a building). As the novel says, the Christchurch motto really is: 'where time is pleasant'. Hopefully you found it so! It's only a 15 minute drive from Christchurch Priory car park (mentioned above), to Highcliffe Castle. Follow the road past where I imagined Jen to live. Castle Street becomes Bridge Street. Keep following the road straight on, across traffic lights, then for a mile or so, until you eventually reach a very large roundabout. Look for the Highcliffe signposts. (Basically, you turn right at the large roundabout and then follow the short dual-carriageway to another smaller roundabout.) Cross straight over the smaller roundabout, and keep straight on and look out for the sign to Highcliffe Castle soon after a golf course to your right. You can park in the castle grounds. Highcliffe Castle is merely the location I imagined for Solent House and Gardens. I chose not to use a real gardens attraction because of the dastardly deeds which went on there. In my head were several garden attractions in the south of England. (One is more like my description of Solent House and Gardens, but you will have to work that one out for yourself.) You can spend a wonderful half-day enjoying the Highcliffe Castle area - or longer! Just about the only thing that matches my fictional setting is the wonderful view, between the trees, across the waters of The Solent to the Isle of Wight. You can best appreciate it standing with your back to the castle. If it is a sunny or clear day, you should be able to see the Isle of Wight across the sea. The so-called cliffs called the 'polar bear' should then be visible at the far right of the land. Why not enjoy a coffee outside at the café? Imagine the café transported to that spot where the trees part and give you the wonderful sea view. Imagine the entire area, including the woods to the west of the lawned area, as being part of the public gardens of Solent House. Then you get near to my setting. Imagine a church to the east of the setting. Imagine the castle replaced by the house I describe. A lot of imaginings for you? Well, that's what being an author is all about! While you're there, why not take a look around the castle and then a walk west (right), through the woods, to Mudeford Quay, along the coast. Watch out for the view through the trees of distant Mudeford Sandbank and Hengistbury Head. If you've read Sandman, then you could always take the ferry across to Mudeford Sandbank where much of its action is set. The way back? Forget a circular route! Go the same way back - or you may have cause to regret it!